8 already heard lengthy evidence. 21 was in November 2005. 14 production of the opinion in question. 29 Department invoked a claim to legal professional privilege. 16 the Department of Public Enterprise. 30 “(a) strictly on a confidential basis. 2 “(b) without waiving the assertion of privilege. 7 relevant and returning the other documents. 1 the 9th of May, 1996. 12 Tribunal’s inquiries, and was pursued in evidence. 19 and, in particular, those of Mr. Loughrey on that point. 6 the 25th of February, 2008. 12 course of its sittings in 2003. 26 the grant of the licence and for the terms of that licence. 3 licence was issued to Esat Digifone. 3 Group Limited of Ireland and Telenor Invest AS of Norway. 19 are high quality and competitively priced services. 17 “Esat Digifone is an Irish incorporated company. 21 Telenor) will be made available to third-party investors. 29 not a mark that was made by the Tribunal. 4 presented in management Appendices B and C respectively. 7 benefits of the licence widely. 14 Ireland; fourth bullet point, Advent International. 27 in the RFP document issued on the 2nd March of 1995. 4 Esat Digifone Limited, the proposed licencee. 16 that stage and she reported to Mr. Sean McMahon. 18 It’s: “Esat Digifone Limited. 10 by IIU Nominees Limited. 26 not have a direct role in the licence. 7 contact me if you would like such a briefing. 13 could largely be avoided by the grant of the licence. 30 of Communicorp and Telenor. 16 April, 1995, to Mr. Towey on receipt of it. 18 I refer you, sir, also to that fax and enclosed memorandum. 6 following information on behalf of Esat Digifone Limited. 27 Employees of Esat: 6%. 10 O’Brien’s interests through Communicorp. 8 course of the licensing process in two respects. 13 Communicorp and Telenor shareholding diluted to 37.5% each. 19 IIU Limited on behalf of Mr. Dermot Desmond. 24 documents and that he was not best pleased. 4 having regard to the competition. 12 in evidence, and inquiries pursued by the Tribunal with Mr.
14 witnesses in relation to its contents. 22 Mr. McMahon and Ms. Finn. 5 the award of the GSM licence to Esat Digifone. 11 the procedure to be followed at the sessions. 4 to the Department the following day. 8 further consideration of licence award. 11 draft GSM licence with Directive 96/2. 15 amendments pursuant to Directive 96/2. 17 It’s dated the 24th April, 1996. 19 Office of the Attorney General. 3 proposed in the transposition of Commission Directive 96/2. 9 prudent to invite the Commission’s scrutiny at this point. 27 the nature of the concession being given to the company. 1 otherwise unreasonable on legal grounds. 10 And it’s signed “Fintan Towey”. 15 relation to four separate matters. 23 the coming into force of that directive early in 1996. 3 And fourthly, the ownership conformity issue. 7 was, and is, material to the Tribunal’s inquiries. 26 is on the monitor, sir. 1 portion of the application outlined in the ownership? 2 Answer: I thought I had seen a copy of this in the papers. 9 of the chart produced. 10 Question: The Regina Finn chart? 27 book. And we can just get those on the monitor now, sir. 7 the application of Esat Digifone which I read out earlier. 11 shareholders, the management and decision-making structure. 22 regarding ownership matters on the 16th April. 30 of 1996, and I can refer you to a copy of that letter. 4 counsel. It’s headed “Urgent”. 20 minute received from the Department and its enclosures. 5 And it’s signed “John Gormley” and “Denis McFadden”. 16 Executive of Esat Digifone. 23 Council’s opinion dated the 9th of May of 1996. 3 of May of 1996. 7 and the opinion of the same date. 15 the opinion have never been opened previously. 20 MS. O’BRIEN: Absolutely, sir, yes, indeed, I will. 2 me and some general advices. 16 who are indicating that the licence should not issue. 24 noises in relation to their complaint. 9 carry on that activity. 12 and it’s signed there by senior counsel. 27 issue.” Then there is a subheading “The Draft Licence”. 9 2, 4 and 5 should be self-explanatory. 9 in the mind of the public. 20 issue shares or transfer the ownership of existing shares. 2 protect the public interest in this regard. 7 understand why this has been included. 9 “In relation to Article 15, I have suggested an amendment. 10 It is largely cosmetic. 20 licence which could be subject to attack. 29 challenged, it will be in difficulty. 2 the subject matter of a set of regulations. 13 infrastructure and other facilities and sites. 30 Signed by senior counsel, dated 9th May, 1996. 11 in the course of evidence. 13 And I’ll just refer to that letter of the 13th May, 1996. 16 Department of Transport, Energy and Communications. 13 considers could be subject to attack. 26 And it’s signed by Mr. Gormley and Mr. McFadden. 1 opinion, or indeed of the letter dated 13th May, 1996. 10 after the licence had issued. 29 from the information notified to the Department. 1 the 21st February, 2003 (day 188). 7 transcript for that date. 24 prudent to invite the Commission’s scrutiny at this point. 10 outlined in the company’s application, must be addressed. 8 informed me that there was any problem on the legal side. 17 General himself has informed the Tribunal so? 27 conformity issue had not been given. 16 was advising the Department at this time. 19 dated the 9th May, 1996. 6 Mr. McGonigal is entitled to broach the matter? 8 “Mr. O’Donnell: Mr. McGonigal raised this with me before. 26 session. It is for no reason other than that. 28 “Chairman: Yes, I accept that Mr. McGonigal. 26 Minister should not drag his feet in issuing the licence. 17 had arisen arising out of the Persona complaint. 23 advice at the time. 16 Answer: Could you repeat that again, Mr. McGonigal? 19 Article 8 which related to ownership, I think? 22 relation to getting it right for different reasons? 8 of legal professional privilege. 27 I think you have that? 28 Answer: I have that, yes. 29 Question: And were you aware of this opinion? 1 became aware of it later. 3 on the second page. 4 Answer: Of the opinion or the covering letter? 5 Question: Yes, of the opinion. 15 careful about this now and how it is being presented here. 23 brought to the attention of the Tribunal in this respect. 25 “Chairman: Well, it certainly hasn’t been opened. 27 “Mr. Coughlan: Certainly not, certainly not. 29 “Mr. McGonigal: But this is a relevant document, Chairman. 3 the practice of the Tribunal to open an opinion of counsel. 6 matter for Mr. Coughlan and his procedures. 21 the stated view of the Attorney General on the matter. 6 it at this time. 13 Attorney General has been indicated to all of the parties. 7 would be very hesitant about. 18 because it is material and I will quote it on that basis. 24 of the nature of the document in that context. 27 going to have regard to it? 12 available to his solicitors. 1 letter dated the 6th December, 2005. 18 of Richard Nesbitt dated May 1996. 5 a waiver of privilege on its behalf. 10 Tribunal with written submissions addressed to that issue. 16 all were extended the facility of responding to them. 9 It’s addressed to Mr. Stuart Brady. 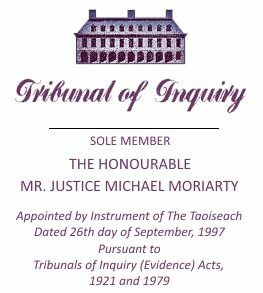 11 “re Tribunals of Inquiry. 14 My Client: Department of Finance. 3 disadvantageous to the Department. 14 the circumstances in which he gave it. 2 best deferred until five past two. 4 THE TRIBUNAL ADJOURNED FOR LUNCH. 24 somewhat limited. However, he does recall the following. 28 to tightly control ownership changes could be sustained. 8 undertaken in Esat Digifone. 3 company’s application must be addressed. 10 during the relevant period. 4 from awarding the licence to the consortium in question. 30 addressing, for the most part, the Article 8 wording. 16 relation to those matters. 18 And that, sir, completes the Opening Statement.